Namkaran is one of the most important of the 16 Hindu 'samskaras' or rituals. In the Vedic traditional, 'Namkaran' (Sanskrit 'nam' = name; 'karan' = create) is the formal naming ceremony performed to select a newborn's name using traditional methods and astrological rules of naming. This is generally a happy ritual - with the tensions of childbirth now over, the family comes together to celebrate the birth of the child with this ceremony. Namkaran is also called 'Palanarohan' in some traditions, which refers to putting a child into the cradle (Sanskrit 'palana' = cradle; 'arohan' = onboard). How is the Namkaran Ritual Performed? Learn how to arrive at the first letters of your baby's name using Vedic astrology before selecting a name from the Baby Name Finder. 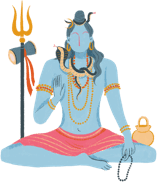 What is the Ceremony of Namkaran in Hinduism?